From the beginning of the 8:00-plus opener "Hushed by Devotion", Jesse Sykes' husky, haunting voice and Phil Wandscher's rugged, ragged guitars combine to let you know you're in for a singular experience, a strong and truly timeless record. Self-produced by Sykes and Wandscher, and released on the band's own Station Grey record label, the band is to be congratulated and applauded for creating this heavy, beautiful masterpiece. In playing "guess the influences," I'm coming up with echoes of Sticky Fingers-era Stones, Fillmore East-era Allmans (check out the way the guitar swings in the title track - manna to your reviewer here, who has always thrilled to "In Memory of Elizabeth Reed"), heck, even Meddle-era Pink Floyd... it's hard to come up with a precise analogue, but perhaps this is piquing your interest. of everything that you know. it makes sense that the music would be pretty unrestrained. There are a lot of lyrics about the ends of things, regrets and letting go, and the music supplies a haunting backdrop for the exploration of those ideas. It also supplies a sort of runway for letting go, with extended fierce guitar runs throughout the longer songs. 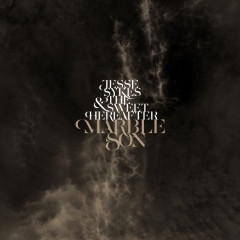 Heavy rock, folk, country, blues, psychedelia... To try to classify this record is to minimize their accomplishment...Marble Son is recommended for people who like any kind of rock music.